This may seem like stating the obvious, but the power of a timely gratitude gesture from a nonprofit to its donors can never be underestimated or taken for granted. And no, the donation acknowledgment receipt won’t suffice as a proper thank you. 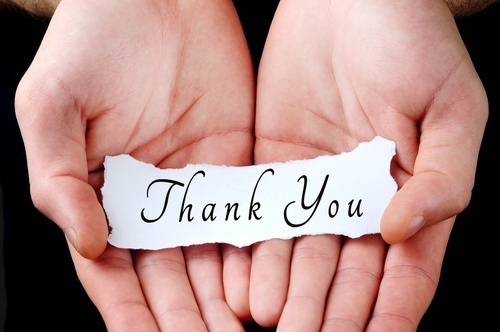 If you’re fortunate enough to meet your fundraising goals, don’t risk derailing any positive gains by neglecting to thank your donors. This blog post suggests 5 ways nonprofit marketers can say thank you after #GivingTuesday to capitalize on the momentum and nurture donor relationships. Although an email is no substitute for a personal, handwritten thank you note, it’s an easy way to quickly follow up with donors while your cause and their donation are still top-of-mind. Let your donors know how much you appreciate their generous gift—no matter the size. Assuming you’ve already developed a nurturing campaign that includes email workflows, be sure to get your thank you emails out right away. Take this opportunity to invite new donors to join your email list to receive your e-newsletter and to learn about upcoming events. Nothing says “personal” or “special” like a handwritten note with a donor’s name on it and an ink signature from a real person. In this age of digital communication, letter writing is a lost art. But in reality, a handwritten note is a timeless gesture that can physically capture a moment in time in a way that an email can’t. When a donor cares deeply enough to invest in your cause and in your organization as the steward of that cause, what better way to show your appreciation than to invest time and effort in a handwritten thank you note that can be touched and treasured forever? Social media might not be the first channel that comes to mind when thanking donors, but like email, it’s fast and effective. If you’ve collected Twitter handles and/or Facebook usernames from donors, consider tweeting or @ mentioning your gratitude to major donors in social media posts. If you haven’t collected social media account information from your donors, consider adding it as an optional field on your next campaign donation form. Some donors will gladly provide the information, particularly younger donors. This will allow you to follow (not stalk) your donors on Twitter and engage in online conversations. Publish a blog post right after #GivingTuesday to give a shout out to your donors and to let them know the results of your campaign. Donors naturally want to know how their contribution helped you reach your goals. And even if you don’t reach your fundraising goals, receiving that information can motivate your donors to increase their support. This is a good time to let donors know how their money will be used to improve lives. Promote your blog post on all your social media networks, and don’t forget to ask new donors to subscribe to your blog. e-Newsletters are among the most popular communication channels for nonprofits. As you plan a storyline for your upcoming e-newsletter, be sure to include a special acknowledgment page to thank your #GivingTuesday donors. Consider repurposing your blog content for the e-newsletter update. Report your campaign success metrics, describe how funds will be used, and if enough time has passed, share success stories that show your donors how their contribution is changing lives. May your #GivingTuesday campaigns allow you to successfully meet your goals in helping those in need.